If you use your computer regularly for business or pleasure, you’ve probably run into one common problem: not having enough storage to hold all your documents, images, programs – you name it! This is precisely why many people decide to buy larger hard drives. Other computer users rely on external storage solutions like compact discs and thumb drives. But these storage alternatives aren’t without risk. What if your hard drive crashes and erases everything saved on your computer? What if you lose a compact disc with valuable information needed for a work project? It may be time to jump on the trend of cloud storage. Sure, cloud storage may be the latest buzzword in Internet communities, but understanding what it means could help you to effectively and safely store extra files without bogging down the running speed of your PC. There are countless options when it comes to cloud storage to store items like images, e-mail messages, and any other type of digital data. Cloud storage functions with one or many servers that allow subscribed users to store their files online in an external database. 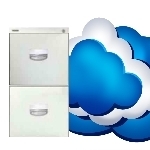 Any time you want to access your image, file, or document, it will be done through the cloud storage server. Windows Talk cloud computing, cloud storage. permalink.